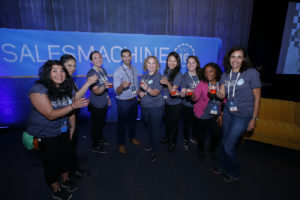 I returned from a trip to New York a couple weeks ago where I was a producer for the Sales Machine Summit. I managed the speakers and stage for the Breakout Stage. It was my third time working with this particular client but it was a first-time conference and it went very well. Our team ran like a well-oiled machine and we all rocked our areas. Not to mention that we made all those Sales Machine t-shirts look gooooooooood. One of the keynote speakers on the Main Stage was none other than Seth Godin. One of the very first events I produced when I moved to San Francisco was an event with a panel that Seth moderated in NYC nearly seven years ago. I had no idea who he was when I signed on for the project. I didn’t interact with him much at the event but I read his book Linchpin on my flight home and it changed my life. Linchpin was all about how we have all the ability to be linchpins– people who are indispensable and make everything better for having been a part of it. Linchpins do their work like an artist creates art. They change people and make a difference. I was so moved by the book and have been finding my way to make my mark on this world ever since. I highly recommend that you read his blog once in a while. I had the opportunity to be with Seth during his tech runthrough with my fellow Speaker Manager who was in charge of the main stage. I had the chance to tell him that he has really impacted my life and that I hope to host my own events soon. He has made such an impact on my life that I was afraid I would get overemotional when I was speaking with him but I remained collected– YAY. I managed the speakers on the smaller stage which consisted of lots of panels and product demonstrations from sponsor companies. Speaker and stage management is a high-energy job that I really enjoy. I get to make sure the people that are bringing the content and knowledge to the attendees is prepared to put on a super impactful talk. I juggle all the moving parts between the speaker, timing of the show and communicating with the audio-visual team. The fast-paced nature of it is such a blast for me. My focus has shifted to working on the upcoming Code for America Summit where I will be in charge of their sponsors. I am managing their deliverables leading up to the Summit, such as inclusion on marketing materials, as well as the logistics around their booths during the “Tech Fair.” Code for America is an awesome organization that does work to create more transparency and efficiency in government with technology. They are one of my favorite clients and I’m so excited to be working with then for the fifth year in a row!